Geek Fuel is now Geek Fuel EXP! EXP is a quarterly subscription box filled with tees, hoodies, comics, and goodies – they promised $100 in value for every box + a Steam game! 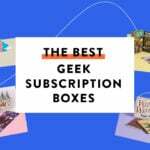 Geek Fuel has moved to a quarterly, high-end subscription – each box is just loaded with items! Volume 2 of the EXP box features 8 items across a number of different fandoms. Ant-Man Comic Shirt – Value $15? I love a good classic comic t-shirt – and this one is perfectly done! The graphic is big, bold, and has that early comic feel to it. On top of the graphic, the shirt is comfortable, lightweight, and breathable! There is even a little design on the left sleeve – again, it’s all got that comic feel to it. Predator Bobble Head – Value $15-20? There are two vinyl figures in this box (yay!) – the first is a Geek Fuel exclusive that features a classic – Predator! This is the basic variant, but there is also a battle damage variant that is limited to only 500 – did you get one? This might be the first bobblehead that Geek Fuel has made in-house – and it’s really good quality! I thought it had good detail and a pretty good paint job to it – I liked it. It’s about the size of a POP figure – with a smaller head, so the proportions are still sensationalized, but a little closer to the on-screen character. Make your own Predator diorama from the Geek Fuel box! I do love when companies make their boxes part of the experience. I don’t think it’s a secret that I love Qmx’s Q-Fig line – it might be the most perfect little vinyl figure line out there! It’s still playful and fun but they don’t really over-sensationalize the character proportions like Funko figures. This quarter, I got the figure I’ve been waiting to buy in a sweet variant – Deadpool’s #unicornselfie figure! These figures have been really close to a gold standard to me for a while now. The paint job and thought put into the figures is typically top notch! I know it’s just a matter of time before I get this incredible Deadpool Q-Fig! It’s fun to see some Geek Fuel exclusives from brands like this as well – it bodes well for future boxes. Spider-Man’s Frist Appearance Canvas Art – Value $15-20? One of my highlights from the Volume #1 box was the Wolverine canvas art – so I’m happy to see the canvas collection continue with Spider-Man! I’ve always been a fan of geeky canvas art pieces – especially when they arrive in a subscription box. These are quality canvases! These are ready to hang or stand right away. Mario Salt and Pepper Shakers – Value $15? Geek Fuel has a long history of creating some unique items, and that trend continues with Mario and Luigi salt and pepper shakers. These are porcelain shakers – and while they’re a tad off to actually use, it’s probably worth it for Mario fans. After playing hours of Mario Odyssey, I kind of just want to throw the Mario hat, though! This is a fun take on an everyday household item! Space Invaders Crew Socks – Value $10-12? For the old-school gamers out there, you’ll receive a pair of Space Invaders crew socks. They are a 98/2 polyester/spandex blend construction. They’re on the thin side and feel like more of a lighter dress sock. The graphic is big and bold while still being a tad more conservative on the leg, where the design might be seen. Don’t you love that new space cruiser scent? Well, this is as close as you’ll get to turning your car into the Rickmobile! Each month, you’ll receive a Steam game – just like the old Geek Fuel monthly boxes – this month’s game was really unique. You’ll fight battles by typing out words as you help the protagonist through writer’s block. It gets a lot of praise – so this is a must-try. Verdict: The big surprise for me is that there were no pins in this box – but I’d much rather have these items than a pin when it comes down to it! I really liked Volume #2 – more than the first one actually – but I’m also a big vinyl figure collector. Between the two figures and the shirt, you’re pretty close to the cost of the box – and they’re all exclusive items. For the non-vinyl figure collector, it could be more of a miss, so I’m curious to hear your opinion! What did you think about Volume #2 of Geek Fuel EXP? Just received mine and am over the moon to find some of my favorite things in the box. I was tad skeptical when I first learnt that it would be a higher priced box and not delivered monthly but now having seen what they pack in – this is definitely a better value for someone like me. The larger box size allowed for them to put in bigger items that I have never seen in other geek or mystery boxes. Cant wait for the next one! All these items are great. I loved the box.